Snake River sockeye salmon following a year where 99 percent of the run died due to lethally hot water. Operators at Dworshak Dam started augmenting flows June 27 to prevent water temperatures at Lower Granite Dam, on the lower Snake River, from exceeding 67 degrees. 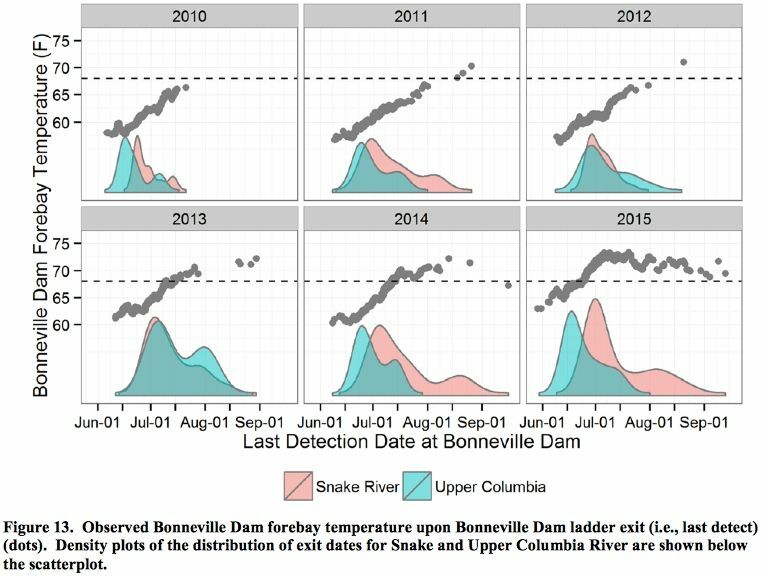 While higher than the 10-year average, temperatures on the Columbia and Snake rivers are lower than they were a year ago, when many fish died because of overheated waters. In the river now and heading upstream to spawn are adult Columbia and Snake river sockeye, Snake River spring/summer Chinook and upper Columbia River summer Chinook. Just beginning their return are Columbia and Snake river steelhead. The anadromous Pacific lamprey are also on their upstream migration at this time. A June 28 sampling of water temperatures on the Columbia River found 66 degrees at Bonneville Dam, 65 degrees at McNary Dam, 64.8 degrees 4.8 miles upstream of the Columbia-Snake confluence, and 59.8 degrees at Chief Joseph Dam. Last year at Bonneville Dam, the June 28 temperature was 70.3 degrees. A few representative water temperatures on the Snake River June 28 were 65.5 degrees at Ice Harbor Dam and 65.6 degrees at Lower Granite Dam, while the temperature a year earlier at Lower Granite registered 66.2 degrees. For cold-water fish like salmon and steelhead, water temperatures should not exceed 65 degrees. Above 67 degrees, fish start dying. One important way to regulate water temperatures in the lower Snake River is through releasing cool water from the reservoir behind Dworshak Dam, on the North Fork Clearwater River upstream of Lower Granite Dam. At a Technical Management Team meeting June 22, fish managers and Dworshak Dam operators agreed to start releasing additional cold water when temperatures at Lower Granite reached 65 degrees. The fish managers wanted to hold off on flow augmentation as long as possible to protect water supplies for cooling and spill later in the season, when adult fall Chinook and steelhead are making their upstream journey through the Snake River system and when late-migrating juveniles such as some fall Chinook stocks are making their way downstream to the ocean. TMT member Steve Hall, water program manager for the Walla Walla District of the U.S. Army Corps of Engineers, said the Dworshak reservoir was full June 27, so dam operators had to release water for that reason as well. Flow augmentation will continue as long as temperatures remain high and the available water supply lasts. Water temperatures can't be readily turned down, Hall said. "It takes about three days for the cool water to reach Lower Granite." The June 27 release at Dworshak was about 7 kcfs. But on June 28, dam operators had to go to full powerhouse, or about 9.4 kcfs, to keep temperatures no higher than 67 degrees, Hall reported. "We had to bump up flow because of Idaho Power's larger releases of warm water [from Hells Canyon Dam]," he said. Last year the 67-degree buffer at Lower Granite was not achieved because of inaccurate solar radiation data, which has since been fixed. But in 2015 the errors meant not enough water was released to reduce temperatures. "The model incorrectly suggested temperatures would cool off if discharge was held at 7 kcfs, when in actuality 10 kcfs was needed. Once temperatures exceeded 67 degrees Fahrenheit it took roughly a week to regain critical mass in order to drop temperatures," Hall said. Meanwhile in 2016, Columbia and Snake river sockeye are returning in greater numbers than predicted -- so far 280,000 adult sockeye have passed Bonneville Dam. The pre-season forecast was for 100,000 above Bonneville Dam. Among the returning sockeye populations are the endangered Snake River sockeye. Based on PIT tag detections, some 450 Snake River sockeye have passed Bonneville Dam to date. During a June 15 TMT meeting, Oregon representative Erick Van Dyke said more attention should be paid to water temperatures throughout the system, rather than just on the lower Snake River reach between Dworshak and Lower Granite dams. He noted that in 2015 most Snake River sockeye died before they reached Ice Harbor Dam, the farthest downstream dam on the Snake River. In terms of other salmon species in the river, about 39,000 upper Columbia summer Chinook have crossed Bonneville Dam and more than 22,500 have passed at Priest Rapids Dam as of June 29. The forecast is for 93,000 adult fish, which would make it the second-highest run size since 1980. To date, about 9,000 Snake River spring/summer Chinook have passed Ice Harbor Dam, which is less than the 10-year average. For juvenile salmon and steelhead migrants at Columbia and Snake river projects, passage conditions this year have generally been favorable, with most smolts or juvenile fish -- though not all -- having exited the Snake and upper Columbia rivers. Seasonably warm air temperatures are expected in eastern Washington and western Idaho for the coming days.